An EPA-approved Source Water Protection Program will give Delaware access to federal money available under the new Drinking Water State Revolving Fund. DNREC intends to set up two low-interest source water protection loan funds. One fund will provide loans for voluntary, incentive-based community source water protection measures such as agricultural resources management planning and implementation programs or developing industrial source water management plans and ordinances. Communities must petition DNREC for these loans and the purpose must be to achieve compliance with drinking water standards for pathogens and contaminants. 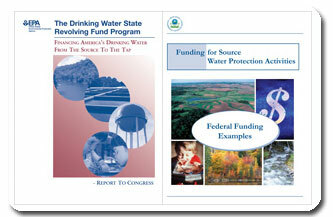 A second fund will provide loans to acquire land or easements to protect drinking water sources. Purchase of these lands or easements must be from willing landowners and must directly promote regulatory compliance or public health. The public will be given an opportunity to review and comment on the loan process.